Humberto appears to have maxed out in strength. Deep convection does not appear to be as impressive as yesterday. This is likely due to the fact that Humberto is slowly moving over cooler water. 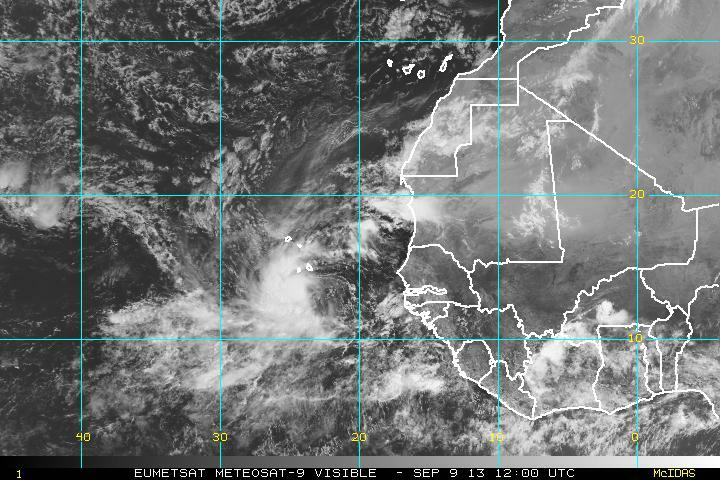 As of 5 am ast (edt) Humberto was centered at 20.5 N / 28.7 W or northwest of the Cape Verde Islands. It was moving north at 15 mph. Top sustained winds estimated at 80 mph (85 mph NHC 5 am advisory). Pressure was estimated at 982 mb. Forecast models take Humberto more northwest over the next few days as it gradually loses strength. Humberto is not a threat to land. Humberto is weakening as is continues moving over cooler water. 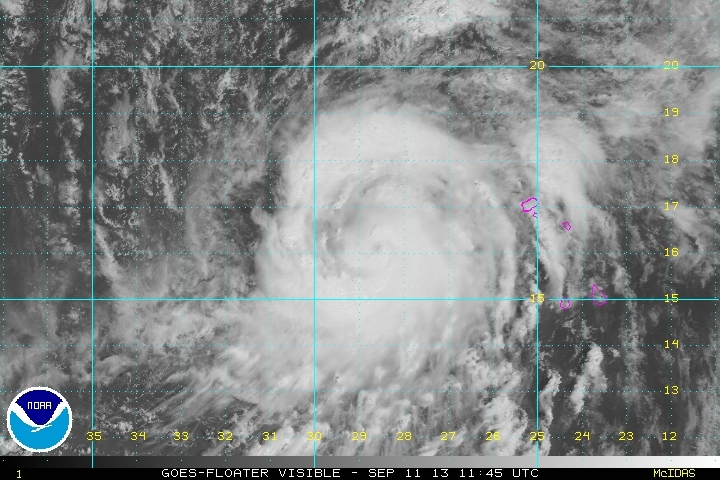 As of 5 am ast (edt) Humberto was centered at 24.4 N / 30.2 W or about 705 miles northwest of the Cape Verde Islands. It was moving NNW at 12 mph. Top sustained winds estimated at 65 mph (75 mph NHC 5 am advisory). Pressure was estimated at 984 mb. Forecast models take Humberto more west northwest over the next few days as it gradually loses strength. Humberto is not a threat to land. 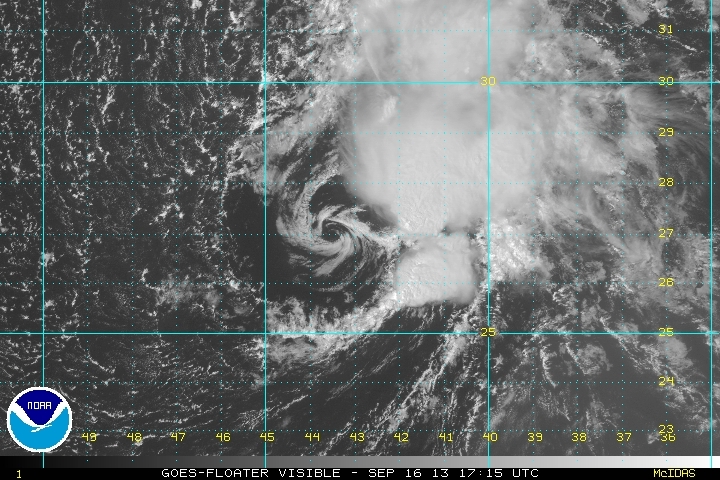 Humberto is a swirl of low level clouds with deep convection well to the north. It should be downgraded by NHC later today. 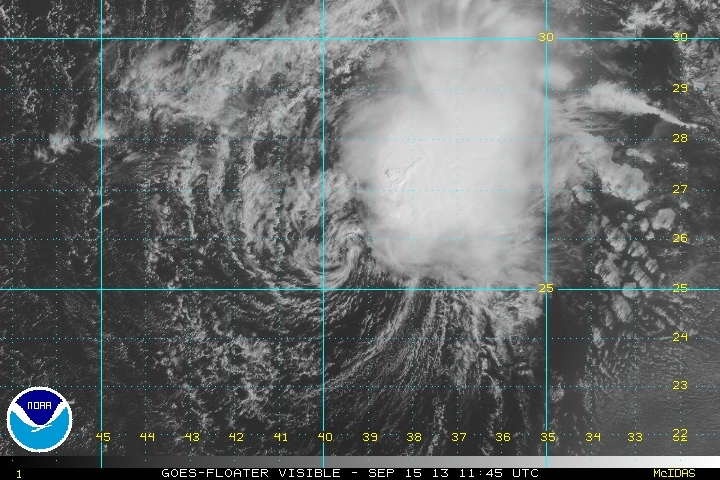 As of 5 am ast (edt) Humberto was centered at 25.0 N / 34.0 W or about 895 miles northwest of the Cape Verde Islands. It was moving west at 9 mph. Top sustained winds estimated at 35 mph (40 mph NHC 5 am advisory). Pressure was estimated at 1003 mb. Forecast models take Humberto west then north over the next few days. Dry air and wind shear have weakened Humberto severely during the last 24 hours. There is a good chance for restrengthening in a few days when wind shear and dry air conditions improve. Humberto is not a threat to land. It is likely that Humberto will regenerate and advisories restarted late today or tonight. Humberto was again classified as a tropical storm. The low center is exposed with convection well off to the east of the circulation. 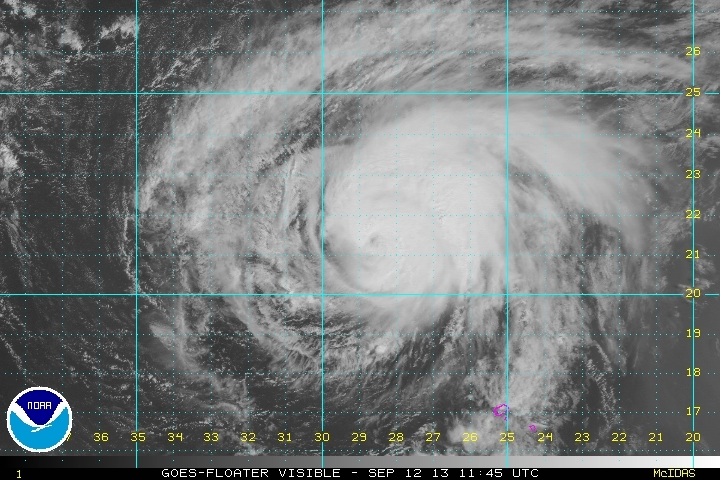 As of 11 am ast (edt) Humberto was centered at 27.2 N / 43.2 W or about 1200 miles SW of the Azores. It was moving west northwest at 8 mph. Top sustained winds estimated at 35 mph (40 mph NHC 11 am advisory). Pressure was estimated at 1007 mb. Forecast models take Humberto northward into the open Atlantic where it will become extratropical in several days. The low was under convection briefly this morning, but shear has exposed it again. 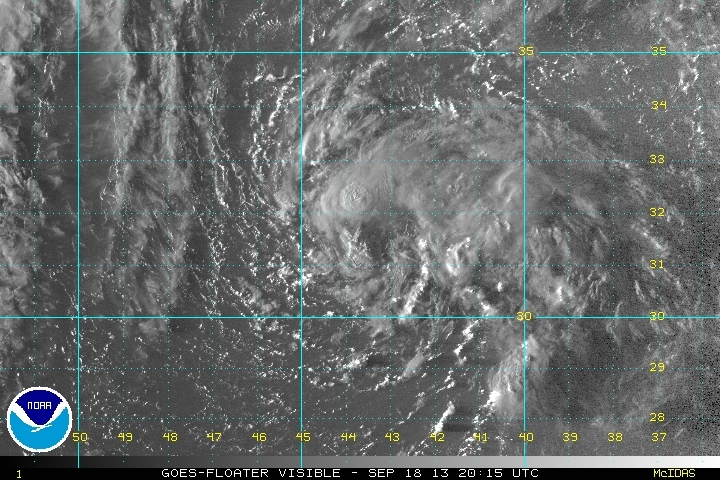 NHC has it becoming a hurricane but I'm not sure it will survive the shear. 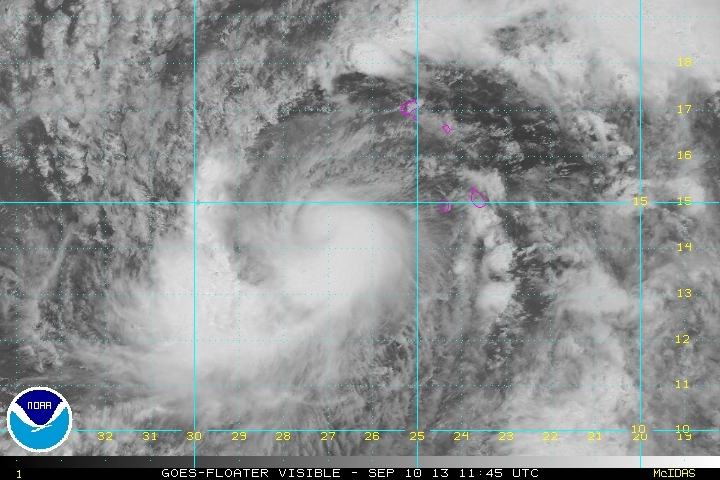 Despite having a broad center of circulation, Humberto is regaining convection. This indicates that shear aloft has relaxed again. Humberto is not a threat to land as it goes through these strengthening and weakening cycles. 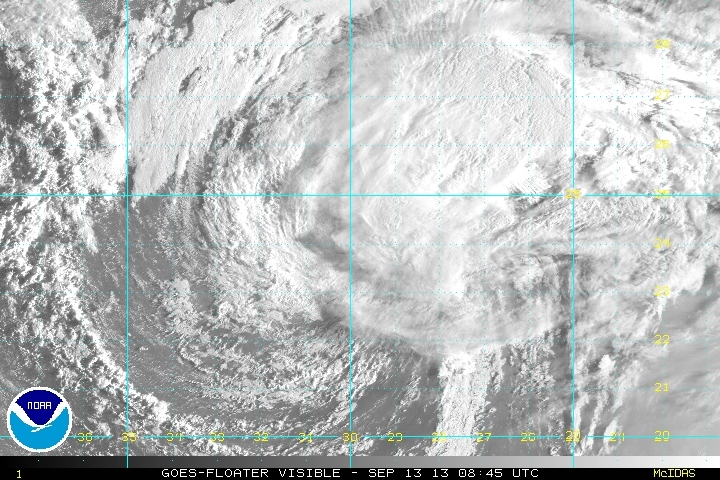 As of 5 am ast (edt) Humberto was centered at 27.8 N / 43.7 W or about 1150 miles WSW of the Azores. It was moving NNE 5 mph. Top sustained winds estimated at 35 mph (40 mph NHC 5 am advisory). Pressure was estimated at 1007 mb. Forecast models take Humberto northward into the open Atlantic where it will become extratropical in several days. 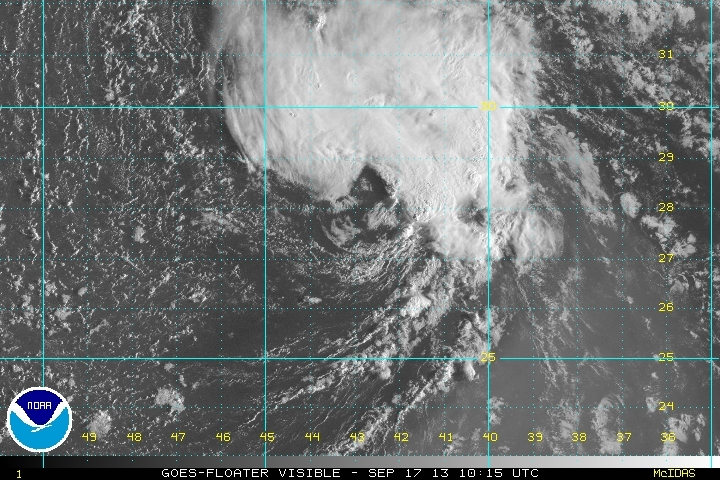 As expected, NHC is no longer forecasting Humberto to become a hurricane. Humberto is continuing northward into cooler water. It is starting to become extratropical and will slowly transform over the next 24-48 hours. 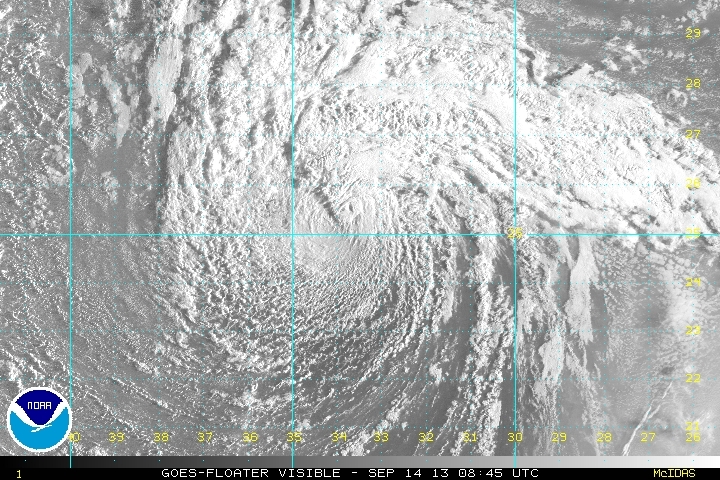 As of 5 pm ast (edt) Humberto was centered at 31.8 N / 43.7 W or about 1035 WSW of the Azores. It was moving north 6 mph. Top sustained winds estimated at 35 mph (40 mph NHC 5 pm advisory). Pressure was estimated at 1007 mb. Forecast models take Humberto northward into the open Atlantic where it is becoming extratropical.